Having spent more than a decade in traditional analyst houses before starting a boutique research firm over four years ago, I've genuinely seen both sides of the coin when it comes to "pay-to-play" shenanigans with analysts. We've heard all the accusations of vendors "buying" their positioning in quadrants, waves and marketscapes for years, and I'll leave it to your own judgement what actually transpires there. In anycase, I think most knowledgeable people just use those things as guides when they make decisions.. and do not always take them as gospel. Am sure we get the some sniping when we run our Blueprints, even though analyst opinion only accounts for 10% of the scoring. However, one practice I seem to be exposed to every bloody day is the blatant opinionating from a host of "independent" analysts/bloggers/pundits/consultants /influencers/journalists who all make a living from the dirty vendor marketing dollar. The oldest model for the dollar-eager "independent". Simply go to vendor conferences, tweet sweet-nothings to noone in-particular (just so their marketing team notices) and write up some favorable pitch for their products/services. Then license it to them for ten grand and Bob's yer uncle. Do one of those a month and you can eke out a meager living for not using a helluva lot of brainpower. Alternatively, just call up a vendor and offer up your praise services, and have them pay you twenty grand to write a white paper where they can have liberal "editing rights". How to identify: It's pretty easy to pinpoint these"independents", and there seems to be an inexhaustive supply of marketeers who persist with feeding the beast for their nice little independent endorsements to add to their handout bags at conferences. Why they haven't figured out that noone trusts (or reads) "analyst" puff-pieces being offered up from vendors is another curious enigma. A more recent phenomenon where the "independent" analyst repeatedly publicly slams a vendor. At some point, said vendor may succumb and write them a check for "subscription services", but the real deal is that the analyst needs to shut the xxxx up if they want to keep those checks coming. This tends to work for the more credible, influential "independents" who don't need to resort to blatant white-papering and reprint-whoring to make their money. How to identify: This can take a while to figure out - essentially watch out for analysts who never offer comment on a key vendor in their space (especially one whom it's not very cool to praise, but has deep pockets). Or just observe which vendors an "independent" analyst likes to criticize and work out why they're not commenting on others. Most pay-to-play independents, who've lost all sight of what it means to be credible, will write nasties about their non-clients and sweet-nothings about the paying ones (unless they are influential enough to make more cash via the Shut-Up model). The vendors who get the nasty treatment have either given up trying to bribe the analyst, or have too much pride to be drawn into the pay-to-play game. Or simply, the money from the vendors getting praised far outweighs the money on offer from the other ones. This type of "independent" is in a constant state of flux praising their money masters and bitching about their competitors. What's often most baffling is some these "analysts" are so lost in their little business model they actually believe the crap they are writing - they truly have become coin-operated. How to identify: Pretty easy to figure these ones. Just read their stuff and join the dots. The Bottom-line: Who can you trust? There is only one opinion, at the end of the day, you can rely 100% on - your own. You'll hear all sorts of puff and bluster, observe all sorts of fancy grids and scatterplot charts, and you'll be able to pick up a lot of useful datapoints, especially with the plethora of free information available today. But the only opinion that ultimately matters is what you see with your own eyes - and hear from other customers who've experienced the products and services. And trust research you know is straight from the customer and not written by whomever is bankrolling it. Talk to the analysts writing the stuff too, as it's harder for them to play the act when they are actually having to give you their real opinion. Sadly, this is only going to get worse before it gets any better. Suddenly, in today's media-insane environment, everyone is an expert and can put out their own version of the world in many different forms and soundbites, across many different information channels. It must be getting really, really hard for some people to keep track of what is real versus propaganda (or just plain crap). I can only hope that better filtering tools are developed in the future that allow us to manage our information environments better, de-social some of the insanity that deluges us, and focus on the experts we trust and opinions that matter. Why are they writing this? Are they credible, or do they have a reputation for pay-to-play? Who ultimately pays them? Are these really their views, or their sponsors? Wow Phil - you've outed the game. Very insightful and bravo for explaining this practice openly. Am sure there are a few sheepish independents reading this! Coming from an analyst, these thoughts are bold! What we're seeing is the impact of social media on the analyst industry. Today there are many unregulated individuals - and groups of individuals - who can exploit blogs/twitter/LinkedIn to publish whatever they want. In the past, it was just the established analysts which could demand money from vendors, now anyone can if they can make enough noise. I'm not saying several of the established analyst firms are blameless by publishing skewed research with dubious motives, but you tend to get a more balanced output when a major company reputation is at stake, as opposed to second tier entity. I believe the established firms only have themselves to blame for allowing this to happen, as they have a great opportunity to differentiate their own research in terms of quality and independence. However, it's the inability of the established analyst firms to improve their quality which has helped exacerbate the problem. In fact the more the independent research takes hold, the more the established analyst firms seem to fall behind in terms of quality - most of their output is so bland, factory produced and unimpactful. I believe the answer lies somewhere in the middle, between a credible analyst brand with analysts that can exploit social media to publish credible, unbiased research with a reputation that can be trusted. However, if the only revenue model these analysts will ever be able to use is pay to play, then this situation is not going to change. Thanks for highlighting this issue. The amount of blogs/reports that clutter my twitter feed and inbox has got crazy, and it's getting harder to tell what is advertising versus research. I am close to the point of tuning a lot of it off! @John - I think we're really witnessing the morphing of media/blogging/analyst/PR/consultant into one confused hybrid model. While pro bloggers traditionally operated like journalists where they would sell sponsorship slots on their sites, several are trying to move to research models where they can charge higher fees to vendors for "thought leadership" as opposed to mere "exposure". Then you've got analysts using twitter to promote vendors who are in their favor and consultants using blogs (or "research") to advertise their own agenda to develop consulting business. Two of the biggest losers in all of this are the online journalists and the PR firms, whose revenue models are being attacked and eroded. The other biggest loser is the consumer of thought leadership / research, who now has to decipher what is real versus agenda-driven... and what is quality versus garbage. Phil thanks for airing this out, we need frequent public conversations on this topic. As for independents, I reject the term in the sense of "I'm more independent than you." I use it only for neutrally describing someone who is not employed by a larger analyst firm. But none of us are independent - all of us are getting paid from somewhere. Whether than money compromises us, and whether there are other factors that compromise us (e.g. relationships, equity stakes) is to some extent up to the reader to decide. Example: I follow bloggers with clear professional ties to certain vendors. They are not the fiercest critics of those vendors, but they often have access to information about that vendor that the most critical bloggers of those firms don't have. I need both those perspectives to make sense of things, but I do need to know who has ties where. I need to understand their business model. However - and I would add this as a key point to your piece - we owe it to the reader to disclose how we get paid and who financed the content we are sharing. I don't see how you can maintain reader trust without transparency and disclosure. We could all stand to do more of that and do it more rigorously. The good news is that every survey I have seen of enterprise buyers tells me that have a pretty good handle on who is worth trusting (their peers first and foremost). Filtering of content, however, remains a huge problem. These days I won't write on most vendor events unless I can get access to customers and make up my own mind. I would suggest in general that honest customer stories are the best antidote to tech overhype and marketing buzzfests. Phil, let me provide a slightly nuanced view. At 5 years at Gartner I felt more pressure from vendors via the Gartner sales force. When a 6 or 7 figure contract is at stake, what do you think happens? in contrast in 9 years as an independent "my analyst" can tell "my salesperson" to pound salt. Maybe I have been careful in the vendor sponsors I agree to work with (btw my sponsors are very visible versus their badges on my blogs. Do most analysts tell you who their vendors clients are?) but they know of our independence policy vis a vis our buy side consulting clients and other vendors. I cannot remember a time when one has asked me to go negative on a competitor. In contrast I am frequently get from non-sponsors all kinds of dirt with the helpful suggestion if I am truly independent I should propagate the dirt. They actually believe they can spread that crap. Some vendors will glibly say I must be biased. My answer to that is if that's the case how dumb are you to not then become a sponsor? That shuts them up pretty quick. Finally run a search on my New Florence blog. It has 4,000 entries over 9 years. Run a search on entries on my sponsors. About 5%. Run a search on their competitors. More than 5%. But the filter for the blog is it is about people, product, places that I and only I consider innovative and much of that is not in the IT vendor world. That is my data driven proof of independence. Like I said cannot speak for all indies but I would be surprised if they do not have similar independence policies. @Vinnie - the main reason I got out of the large analyst firm game was precisely to get away from the stranglehold their sales forces hold over the model, and the lack of freedom an analyst has to truly express himself/herself. And there are a few of us who really are thriving when the shackles are well and truly off! However, there is too much pay-to-play going on - and I have seen so many blatant examples of it recently I thought it high time to get the discussion on the table with those brave enough to have it. It's worse than I have ever seen it (or maybe I just woke up and smelled the roses...). To be perfectly honest, I have always taken the attitude that if people are dumb enough to get fooled by biased "research", or "opinion", that is their lookout. However, it's the strategy of many vendors to propagate this behavior which is also driving me (and many others) to tears. And what is really grating is the practices of some analysts/influencers who are so far "gone" by their paymasters that they generally believe they are unbiased and untainted. The hypocrisy is mind-numbing at times. Perhaps analysts should simply stop taking any $$$ from vendors, and increase the value and content of their offerings by DOING ACTUAL RESEARCH, and raise the prices they charge to end user/buyer/investor clients. @vendor client: Sadly, most independents (and some of the top tier analyst firms) are 90%+ dependent on vendor revenues to survive (many 100%). They would be out of business immediately if they stopped taking the vendor dollar. To do actual research requires a genuine investment in experts who would need to talk to buyers, instead of spending all their time being wined and dined at vendor boondoggles and being brainwashed by their PowerPoint. I know many, many analysts who never talk to end users / buyers - and avoid it like the plague as they have very little to talk to them about. Everyone in the analyst industry knows this, but never talks about it. I would go as far as arguing that many analysts aren't really researchers, but marketing commentators / paid advertorial columnists. Phil - excellent blog post and kudos to you for airing the issue. As a marketing executive, I am constantly getting pitches to sponsor research and thought pieces from all types of analysts, bloggers and reporters. What is different today is that everyone seems to be doing this - a few years ago, it was really just Aberdeen, a few of lower tier analyst firms and some online businesses. Today there are many independent bloggers, analysts and small analyst firms which appear to base their business models on marketing sponsorships from vendors. I started a blog just over a year ago and began to highlight quite a lot of the troubled research, dubious 'white' papers, claims for savings etc. Much of the 'research' builds upon tiers of other claims made in prior 'research'. When you dig at the roots of these claims they fall away like petals from a flower. There is a great deal of misunderstanding over terminology and definition. Lots of claims for savings are based upon a misunderstanding and the savings have nothing to do with outsourcing or sharing services. @Tony - you have a fair point, however, I don't know how analysts can genuinely feel they are doing their area justice if they do not regularly talk to buyers of the products/services they cover. If all you're doing is writing about vendors and only talking to the handful of "prepared" customers that vendors serve up to talk to you, then how can you believe your analysis is credible? A decent analyst will make the time and the effort to talk to buyers - it's not hard to find them... go to conferences, joined LinkedIn groups etc. My take is many of them are lazy and want to take short cuts. Phil it's a fair point re: disclosure resistance. By encouraging disclosures and following that practice rigorously, the more folks do it, the more the ones that don't do much of it will stand out. I think that contrast will be impactful. Though I don't know how much change is possible. Even these blog convos matter however because those who are silent on these issues are sending a message of their own. 1) Who pays them; 2) What do they write / not write; 3) What changes (if any) occur to their viewpoints when payments are made. The problem has simply been that the industry has promoted and paid for this behavior for a very long time. Trying to change the game at this stage is likely futile. Besides, there are influencers out there today everyone knows favor their sponsors, but most just choose to ignore it. Talk about stirring up the proverbial hornet's nest. Having been a buyer & vendor, I have seen these behaviours up close & they are indeed pervasive, especially amongst what I would call the "big box" analysts: the one stop shop for all needs. Arm twist the vendor into coughing up cash for a favorable report or to avoid an unfavorable report. Then of course try to convince buyers like us that we need research + analyst hours and not just pure research. The latest perspectives were very obviously dated, by about a decade or more. The other not-so-new perspectives were theoretical to the extent of being unpracticeable. The rest was just a lot of head bobbing. The top "x"00 ranking lists are even more interesting - try delving into the mechanics of how these are generated and prepare to be horrified as to how they diverge from the core context of outsourcing. The analysts that truly excel at what they do, namely some of the boutiques (you know who you are), spend a lot of time just talking to buyers, providing perspectives and not being just driven by sales & revenues. And it goes without saying that these are the analysts with whom we have deepened our relationships. While one would think that that its common sense to ask the right questions about independence, in reality, this common sense isnt that common due to a host of reasons (conflicting priorities, level of maturity, etc). And while the optimal model would be truly independent, given that most of us still need to put bread on the table and the fact that vendors are the ones that have the most dollars to spend, the dice is already loaded and the real question is how long will the independence last before (a) reality bites or (b) they are acquired by said "big box" analyst firm. One can only hope that discerning readers ask the right questions and get the truly independent views that they deserve. Phil - Shortly after I started contributing to ZDNet a few years back, we had to identify potential conflicts of interest and whether any money has changed hands (e.g., conference travel cost reimbursement). Interestingly, since I started documenting that I own some stock in a couple of tech firms and whether I had travel/lodging covered, I've noticed virtually no drop in readers, no reduced interest from vendors, etc. I say this as I try to write longer, researched pieces and the ones people seem to like the most, pass around the most and comment on a lot, are the ones rooted in ORIGINAL content and research. Only once has a commenter snarked me because I stated that a vendor covered my lodging at their event. People seem to appreciate the intellectual honesty associated with people that can state their potential conflicts. I also disclose that I/my firm does a lot of work with sell-side firms: software vendors and consultancies. I/We also do buy-side work, too, and that work is often fantastic fodder for providing more relevant content. In the comments above, much was made about analysts who don't speak with users. I think they should AND that they should do some real selections and implementations from time to time, as well. Is pay-for-play an issue? Yes. But, like other commenters, I believe that buyers are more savvy than some might think. If someone writes a decidedly fact-free, puff piece, it's pretty obvious. People can discern which writers and firms ADD value and which ones waste people's time. In fact, I do one thing to ensure the best analysts rise to the top and the scummy ones sink to the bottom: I will not link to, help or highlight the 'work' of value-less material. But, once someone posts something of value, I will discuss it. I may not agree with their Point of View but if it's fact-based, I'll foster more visibility to this material. I see great analysts as colleagues not competitors. I want them to be the leaders in the space and I've no problem posting comments on their blogs (like this one Phil!) or exchanging tweets with them. I do not, though, reciprocate for those I do not respect. It is this last point that makes me want to see more of the better analysts promote the work and research of other better analysts. I believe we make the branding of the best analysts better by driving more focus on the better people & research while shunning/starving the cheap, junk-peddlers. Jon Reed's weekly wrap-up of the best research is a great example of how to keep the market focused on the best and brightest in the #ensw space. Thoughts? @Duncan - am a big admirer of your work and your surveys, which am sure you know. I think you're mixing up "independents" with small analyst firms. When I talk about "independents", I am largely referring to individual analysts, but there are a few very small firms there, which really are one analyst and her/his entourage (some of whom perform pretty poorly in your independence chart). I also include the growing band of "blogalysts" who forge a living blogging opinion and taking sponsor money for exposure on their websites and favorable blogs. Some even allow vendors to post their own blogs on their sites for money, which I guess is OK if openly transparent, but hardly the behaviour of an independent thought leader striving for unbiased impartiality! Well, a lot of small firms do have one or two analysts, not just a few. If you';re suggesting that micro-firms are there the problem is, then why is it that firms of all sixes in the survey are seen by their users as having limited independence? I think there's bad ethics in firms of all sizes. @Duncan - agree there is bad ethics everywhere. 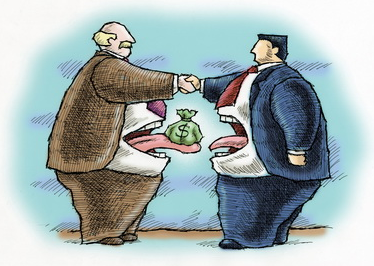 I actually feel the large analyst firms are always the ones that get perennially muddied with the pay-to-play reputations, while some of the little ones get away with even more blatant behaviour (in some cases). I have absolutely nothing to gain from writing the post. Yes, I really don't, except embarrassing and upsetting a few individuals and perhaps making a few enemies. The reason I published it is because I actually care about the future of the analyst business and founded a growing successful analyst firm that depends on an analyst business having a future. I have been observing (from close up) the antics of analysts for years, and the lack of transparency and ethics from a number of individuals (and firms) has never been as bad as it has become in the last year, and the deluge of comments from people here (and in other discussion forums linked to this post) attest to this fact. I am genuinely concerned as to the direction the analyst business is taking, where we have a morphing of analysts, bloggers, consultants and reporters all competing for vendor marketing budgets. I wanted to air the issue and it needs airing and opening discussing. Will anything get achieved by this? Probably not, but giving the issues more visibility, and getting them more openly talked about, is a first step to making people more aware and knowledgeable about how to handle dealing with these pay-to-play issues in the future. And they are rife - and most people here know it. Phil, It's very helpful that you raise the issue of pay to play but don’t understand why you are focussing on small analyst firms. Absolutely, there are small and solo outfits that are terrible – but there are also large ones in the pay to play segment. Frost and Sullivan has 1,800 employees and its market leadership awards are infamous. @Dunc - fair point. The practice is rife across all shapes/forms and sizes of analyst and influencer. However, I have seen some particularly outrageous p-t-p occurrences with little firms / individuals lately which made my skin crawl, hence the rant. And we never even got started on sourcing advisors who use their "influence" to extract money from services vendors... but we'll save that for another time. Phil, Sorry late to the party on this. I thought as an independent I would add my 2c worth. When I started out as an analyst nearly 15 years ago, I realised on day 2 (after being asked to change a research note due to an upcoming renewal) that my reputation and integrity was the most important thing I had. As a result I have (hopefully) safeguarded this in all the analyst incarnations that I have enjoyed. Realising that perception is reality in this regard, last year I published a capioIT business principles. http://wp.me/p15cZf-8x. Examples of the "rules" include: You can't buy capioIT syndicated research prior to publishing, I limit any "white paper" research to a small proportion of revenue etc. I wont compare and contrast. These principles are front and centre on the website, and I test myself on a regular basis to make sure I am still meeting them and I sleep straight in bed :> Basically the critical factor for me is integrity is all I have, whilst it costs me significant money short term, in the long term, it helps me truly love what I do. On to Duncan's point, I am not in the US, so do not see the independent pay to play model issue you are alluding to as visibly, but as you know, I consider some of the legacy analyst firms to actually be PR content providers. Others that I don't think need mentioning are completely pay to play. Bottom line, there are independents who do not subscribe to the pay to play problems, and there are established global/legacy firms who are more guilty than anyone else. @Phil - As we discussed here, I think integrity of analyst is ultimately in the mind of the reader, and takes a while for the analyst to earn. I cannot tell you how many analysts I have come across over the years who claim to be the hallmark of integrity, then you find out later they have been given stock in a vendor they write about, or are paid off to stop sniping at one. Not to mention the ones who just whore out white papers... but they are easy to detect. I know you and your work, so assume that you wouldn't write something you didn't believe was true.